Alex Honnold is a 33-year-old free solo climber, which means he has more of a death wish than your run-of-the-mill mountain climber. Free soloing is the practice of climbing without the aid of any gear or rope. All that stands between the climber and death is whatever small knob they can find to grab onto and a several-thousand-foot drop to the ground below. The acrophobic need not apply, obviously. It may be wise of them to skip the doc too while they’re at it. Having spent most of his life climbing mountains, including free soloing, Alex is looking for the next big challenge. He finds it in El Capitan, a 3,000 high granite wall in Yosemite National Park. He decides he wants to free solo the wall, a task which has never been done before. Few people would’ve even considered attempting such an insane feat. But Alex isn’t like most people. 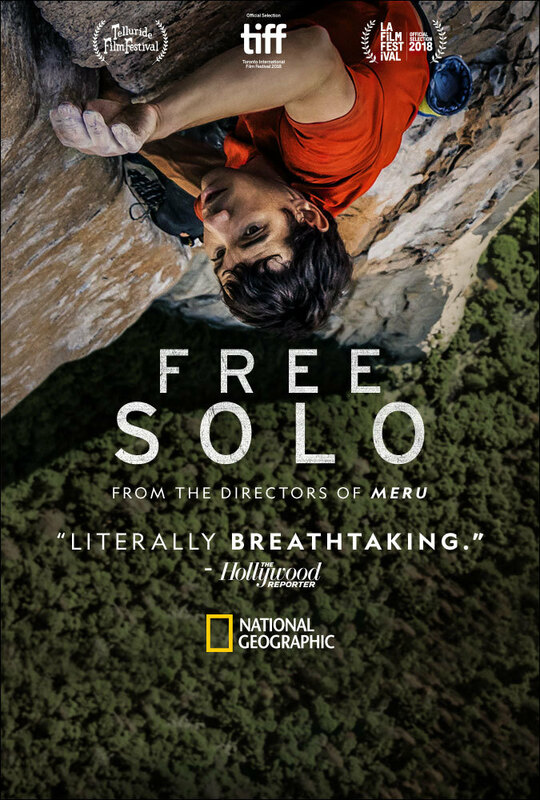 Free Solo follows Alex’s intense preparation and training for the climb, but what sets the documentary apart is the ways in which the filmmakers explore the motivations driving Alex. Having found the personal connections to achievement in Meru, which documented the multiple attempts of three climbers, including co-director and photographer Jimmy Chin, to scale a similarly difficult wall in the Himalayas, directors Chin and Elizabeth Chai Vasarhelyi turn their focus on someone they consider a close friend. The film is at its most fascinating when trying to get a handle on where its subject’s head is. Thin and limber, Alex has the appearance of an overgrown boy, a bemused smirk across his sunken face. He lives out of a van, cooking meals of bean stew and eggs when he’s not training on the hangboard mounted above the door. The lifestyle gives the appearance of a life untethered to the world in a way befitting his chosen method of climbing. Alex is very open about not feeling a need to form close personal relationships, as he feels that those commitments would keep him from the greatness for which he strives. Nevertheless, those relationships do form. The most prominent of them is with his charmingly sweet new girlfriend Sanni McCandless. It’s clear that she brings a warmth to his life, and is winningly committed to him. But he is also painfully honest with her about what he feels his needs and responsibilities to her are, and how freely he would abandon them if he felt it necessary. To call the relationship one-sided would be overly harsh, but the imbalance is clear. In a film full of scenes that are difficult to watch, Sanni’s tearful goodbye the night before a climb is the toughest to stomach. The fear also exists that the distraction of these relationships might directly contribute to Alex’s death, a notion seemingly confirmed when he decides to bail on a first attempt at the climb. An MRI taken early in the film shows Alex’ fear centers to be underdeveloped, but his close connections may be causing them to finally light up. The crew is equally concerned with Alex’ well-being throughout the film. Vasarhelyi allows the camera to peek behind the scenes, with Jimmy Chin often appearing on camera, as they discuss the logistics of shooting the climb. Their conversations also drift into the realm of ethics. Alex invited them there to film him attempt, but no one wants to be there to record his death, let alone cause it through distraction. No one wants to see his body plummet through the frame. Watching the crew grapple with their misgivings is fascinating, and intensely relatable. One cameraman refuses to even look through the viewfinder for one section of Alex’s climb. Audiences may be watching through webbed fingers as well. Vasarhelyi and company pull out all of the stops to document the climbs, including drone footage and manual steadicams manned by crewmen dangling from ropes alongside Alex. The footage has a distinct verticality that drops the stomach as well as the jaw in suitable amazement and nervous tension. Great pains are taken to put the viewer right alongside Alex for the journey, with a clear sense of geography and demonstration of the challenges. The expertise of filmmakers who are also rock climbers is employed to great effect in the prep sequences. To a layman like myself, any vertical wall would look the same, but the film makes great pains to explain the specific challenges of each section of Alex’s climb and why they are so dangerous. By the time Alex comes around to making his final attempt, it pays off as we know exactly what he faces and anticipate his success - or failure - with gritted teeth. Above all, Free Solo is a testament to the great challenges of the world and what it takes to discover and overcome them. It takes a special kind of person to want to do something like what Alex has accomplished, but those people would always exist. There will always be things to conquer, perfection to chase, and whether or not they are worth doing, there will be those who are more than glad to try, and let us watch in amazement. Free Solo is now playing in select theaters.